Yesterday, I saw a number of icebergs in my dreams. Hopefully they are not precursors to my own personal Titanic in some aspect of my life. I should mention that I am meeting with the Provost at my University today (in 29 minutes, gulp) as the next stage of my tenure process – but it is considered to be “over the hump” at this point, my mentors tell me. Perhaps all of the iceberg imagery was in relation to a bit of worry about yesterday’s post on the love-hate relationship we have with Turkey in this home (my view, M. has not weighed in on this) and whether 301 will be used against me if I speak out more…for those of you not in the know, “301” refers to Article 301 of the Turkish Penal Code which, according to Wikipedia “makes it illegal to insult Turkey, the Turkish ethnicity, or Turkish government institutions.” I do not think I have done so, I was careful in how I framed my word, but who knows how my best intentions are interpreted. Don’t get me wrong – I adore Türkiye but am aware that there are some challenge – as with my own country and as with any country. So, leaving fear of 301-shaped icebergs behind for the moment, the icebergs I am going to refer to in this post are icebergs in Türkiye of a very different sort. Thee are the icebergs that do a lot of melting while M. and I are in Turkey. The graphic called “the cultural iceberg” should explain it all. I’ll spend the next few days breaking down what has been floating above the line in my life – and where I think we are going re: figuring out what is below the line in our life (note my vs. our as it is a process). 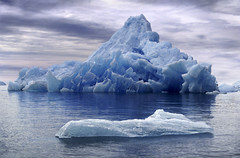 Keep it locked, as the radio station host say – and let us know how your icebergs work. I’ll be back with my views on our icebergs tomorrow. This entry was posted in Academic hell, Cross-cultural learning moments, Visits from the Karagöz puppets and tagged Iceberg, Middle East, Politics of Turkey, Provost, Titanic, Turkey, Turkish government, Wikipedia. Bookmark the permalink. Pingback: Icebergs in Türkiye « Slowly-by-Slowly | Freelance Takıl!